Shop Perfumania Clearance Event and save extra money. 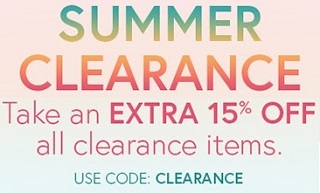 Take an extra 15% off all clearance items. Summer Clearance Event is ending soon! It's your last chance to save an extra money. The offer is valid online only. To receive the offer use promo code CLEARANCE at checkout. Source of the information is Perfumania. The offer is time limited. Get more details at Perfumania online.